Since I cook most of the week, I like to keep it simple and stick with dishes that are fairly quick and easy to prepare with fresh and healthy ingredients. Taste is important and so is nutrition. 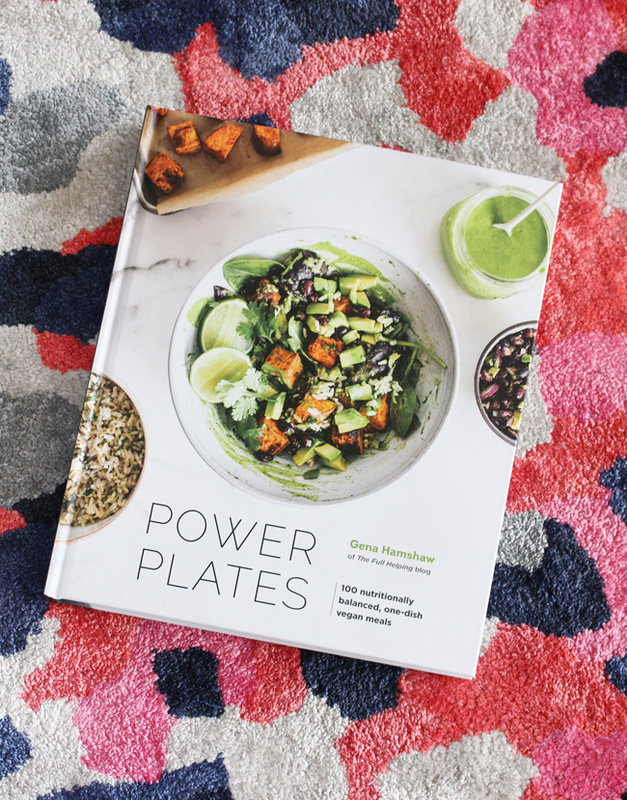 Featuring 100 nourishing one-dish vegan meals, Power Plates is just the type of cookbook I gravitate towards. Certified nutritionist, Gena Hamshaw has put together a collection of balanced recipes that deliver wholesome nutrition and sustained energy. Power Plates puts the focus on macronutrient-rich meals comprised of proteins, complex carbohydrates healthy fats. The chapters are broken down into Breakfasts, Salads, Soups, Bowls, Skillets & Stovetop and Bakes. I was especially happy to see that there is no chapter on desserts which always feels like a waste to me. There is a variety to the recipes with unexpected combinations and they cover a diverse range of cuisines that span the globe. 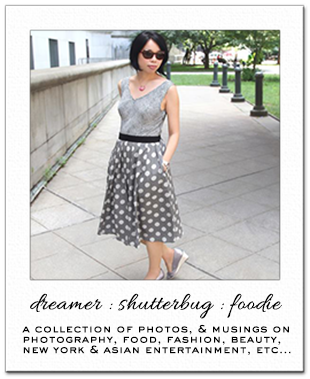 A beautiful photograph accompanies each recipe. There is also a section that includes helpful tips and tricks for prep and cooking as well as how to take food on the go and cooking ahead. We're not vegans, but we do eat more plant-based meals than anything else. This book is so inspiring and it makes healthy eating easy and delicious. I'm definitely going to be reaching for this book as I see so many recipes in there I want to try. The breakfast section is particularly inspiring with recipes like Tofu Migas and Cauliflower Scramble. I've never been one for traditional breakfast foods so I love seeing dishes that contain both protein and vegetables. And she has two recipes for savory oats which is the only way I'll have my oatmeal. I had been making a dish similar to this Rice, Beans, Tofu, and Greens but somehow I never thought to include tofu. I love how the addition incorporates another protein element so that I don't need to prepare one separately. I like to make this with forbidden rice and I usually use kale or spinach. It's so simple and tasty. 1. Heat the oil in a large pot over medium heat. Add the onion and bell pepper and cook, stirring occasionally, for 5 to 7 minutes, until the onion is tender and translucent. Stir in the cumin, chili powder, paprika, and salt, then stir in the beans, tomatoes, rice, and water. Add the tofu and stir gently to combine. Bring to a boil, then lower the heat, cover, and simmer, stirring gently from time to time, until the rice is tender, about 20 minutes for white rice or 40 minutes for brown rice. 2. Add the greens, cover, and simmer for 5 to 10 minutes, until the greens are wilted. Season with red pepper flakes and stir in lime juice to taste. Taste and adjust the seasonings if desired. Serve right away, with any additional toppings you like. I love cookbooks and this one is perfect for a nutrition meal thanks for sharing need to check it out. 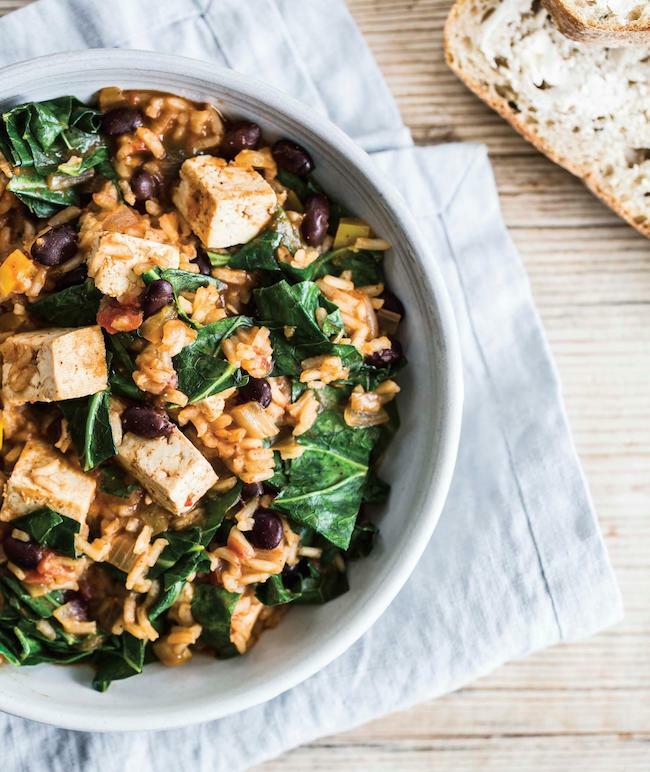 We've been having rice and beans lately and I love the addition of tofu and greens! I love cooking books. Trying new recipes has been my hobby. This book looks good for cooking. The recipe you have tried looks yummy. I usually don't do the cooking in our family, but whenever I do books like that are amazing. Healthy yet quickly done! I’m a huge fan of recipe books. I get to experiment with lots of recipes and it’s very therapeutic and makes me feel good. This sounds like a great cookbook to try healthy recipes! Have a great weekend Rowena! That recipe sounds so delicious and easy to make. I need to check this book out. I'm not a vegan but I'm also not a big meat eater either. This recipe sounds amazing! Do you think it can be done in rice cooker? Yeah I saw this on your IG feed, this book looks beautiful I love to collect well designed books. And the recipe sounds so good, you did a great job and love the photo. And a great way to introduce one to a more plant-based diet. I'm not vegan either, but my diet is pretty much based on vegetables, so this book is something I could use. I will look it up. It looks so good. What a nice book. Love how it focuses on healthy but tasty meals. I'm not a vegan but I will give some of these a try. I am going to have to check out this book! These plates look amazing!